It is fast approaching; our thoughts are turning towards that special lady in each of our lives. Yes, you guessed it! Mother’s Day is all about celebrating the delightful, caring and wonderful woman who has given you so much. Sunday 10th March 2013 is the perfect opportunity to return the favour and show her just how much you care. This could be buying presents to complete a beautiful home, treating her to a gift to help her relax or simply purchasing a present which the two of you can enjoy; a memory shared. A small token of gratitude lets her know just how much you appreciate her being around. Where did Mother’s Day come from? Thousands of years ago ancient cultures celebrated ‘motherhood’. Motherhood was personified as a goddess and was extremely cherished and loved. This is not directly linked to Mother’s Day but parallels can be made. In the 17th century Britain began celebrating Mothering Sunday where it was honoured on the fourth Sunday in Lent. During this time servants could return home for the day and visit their beloved mothers. They would often take small gifts such as a cake. By the 19th century this holiday had almost been forgotten, however after the Second World War Mother’s Day was reintroduced. It is now an important day celebrated across Britain celebrating mothers and motherhood. We have listed our favourite gifts for Mothering Sunday below. These are presents which show thoughtfulness and gratefulness. If you are unsure what to buy for your mother, then you could always buy a Wineware gift voucher, available in £10, £25 & £50. Complete her glassware collection with this set of Scott Zwiesel wine glasses and a wine decanter. It looks truly spectacular on any table setting and allows wine to be enjoyed at its fullest potential. Schott Zwiesel glassware is made from Tritan Crystal; read all about its benefits and qualities here. A nice bottle of Cabernet Sauvignon and you will have a well thought out present. 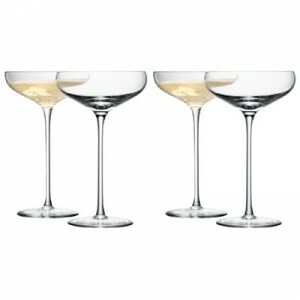 This set of four champagne saucers makes the perfect present for your mother this Mother’s Day. These elegant glasses are ideal for toasting to a loving relationship between mother and son/daughter. Celebrate the years past and the years to come! The saucers arrive in a special box with photographs displaying the individual pieces and the intricate hand production. We do also advise buying a bottle of Champagne as well, this will really put a smile on her face! If you know she loves hosting dinner parties or small gatherings then this is the ideal present. This 7 piece serving set makes light work when serving small dishes, dips or finger food. The multi-faceted glass and porcelain bowls and bamboo are decorative and stylish as well as functional and practical. If she enjoys a glass of wine (especially red) then why not treat her to a high-quality wine decanter. This handmade decanter is truly stunning and allows wine to breathe; reaching its fullest potential. 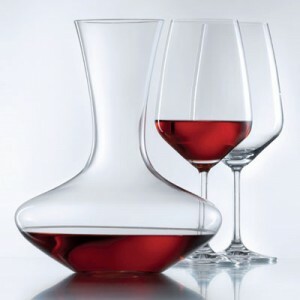 The decanter’s shape is perfect for decanting red and white wines alike. Why not buy this decanter, and a bottle of wine from your local wine merchant or shop? Decanted wine definitely makes a difference to the wine tasting experience. Tableware is one of the most useful and practical presents for Mother’s Day. The L’Atelier du Vin cheese board is a welcome addition to any household and is ideal for those after dinner wine and cheese moments! The ceramic platter allows cheese to develop in flavour and makes an eye-catching centrepiece for any table: suitable for formal and informal occasions. – 73% of mothers surveyed hope for a present on Mother’s Day. – 20% of men admit to having forgotten about Mother’s Day in comparison to 8% of women. – 34% of mothers answered they like to be taken out for a meal. – 26% of sons say they’re likely to take their mother for lunch or dinner on Mother’s Day in comparsion to 20% of daughters. What will you be doing to treat your mum for Mother’s Day? We want to hear your unique Mother’s Day suggestions. Please see our Mother’s Day gift ideas page. Finally we wish you all a very happy Mother’s Day!